Maybe it’s true. Maybe Capitol Hill really is no longer viable for record stores. CHS has learned that a little more than one year after its move to neighbor 10th Ave’s revamped Elliott Bay Book Co., Capitol Hill’s Everyday Music is being replaced by a Seattle women’s fashion boutique. Seattle Met originally reported on the impending move of Totokaelo to the “Oddfellows Building” (sic) back in June. Now we know that the move comes as Everyday is moving out of the overhauled 10th Ave space after moving from Broadway in spring 2010. Kuzma said given current business conditions, it didn’t make sense for his store to try to weather more years with the expensive lease the location entails. For Everyday, the coming move will be its third since it was displaced from its original Broadway location by light rail demolition and construction. It lived for a time at Broadway and Pine in the location that is now Blick Art Supplies. Despite his concerns about a lack of visibility at the location, Kuzma decided to take a leap and try the 10th Ave location neighboring Elliott Bay because of the buzz around the new store’s move to Capitol Hill. While Elliott Bay has repeatedly touted strong sales numbers at the new location, Kuzma said Everyday’s Capitol Hill location wasn’t keeping pace with the rest of his business with stores in Bellingham and Portland. In Portland, Kuzma said, he’s also getting better help from his landlords. We’ve asked Hunters Capital for comment on the change and will update if we hear back. People familiar with the situation say they had heard Hunters was considering everything from “big box” retailers to local boutiques like Totokaelo for the space. UPDATE: We had an opportunity to speak with Jill Cronauer of Hunters Capital who tells us that, while they’re sorry things didn’t work out with Everyday, Hunters is really excited about Totokaelo. The change marks the second record store this summer to say it is pulling up stakes from Capitol Hill. In June, Sonic Boom announced it would leave Melrose Market by fall saying the Hill was no longer a “viable” environment for music stores. loved this shop for years, but lately when i went in they never had what i wanted and the prices seemed rather insane compared to the other shops around. i knew we’d lose them eventually. at least people are still buying books! Sorry to see E.M. have to move again. I hope they can find a new spot on the hill. I wouldn’t mind seeing them moving to the University District. West Seattle, Lower Queen Anne, Ballard, and Northgate (Easy Street, Silver Platters, Sonic Boom) are fine, but something more central would be great. I never shopped for music on Capitol Hill even when it was still possible. And the Ave. hasn’t been the same since Cellophane Square, Tower, and Second Time Around closed. I love having EM in my neighborhood. I’ve always been proud to purchase all of my music needs at EM, and never from a larger, corporate chain. I have always found the selection and the prices to be fair, competitive, and reasonable. The sales help is always kind, helpful, and knowledgeable. Honestly, the loss of this store makes me sick. We don’t need another high-priced women’s clothing boutique in Seattle. Shame on the greedy landlords. Sad to see EM go. I always preferred Sonic Boom, but my business would certainly have shifted to EM now. Now I’m not sure where I’ll buy cds. I never would have expected that Capitol Hill would not be able to sustain several record shops. Better a high end clothing boutique than yet another restaurant in the space, but still – can’t get excited about it. I love Everyday Music. Personally, I’d love to see the loathesome B of A on Madison go and have them move in there. Then they’re walkable AND have a few parking spots. will Totokaelo have vegetarian and vegan options? What about gluten free? This is some really sad news. Spending afternoons in Everyday digging through vinyl and listening to new music was one of my favorite things. I can not walk into that store without dropping $50-$60 at least. I really hope they find a new home. Capitol Hill needs a music store. Don’t worry Liz, if they’re too high-end you won’t be the only one that can’t afford anything there. And before you know it….”this too shall pass”. jerk. you know, for some people gluten free food is a necessity, not an option. it’s not just trendy. It was such the perfect location for me, and the proximity to Elliot Bay definitely worked on me — I’ve gone in and bought something at both places multiple times. There’s some empty spaces still on 15th — maybe they could move up there? I know there’s a lot of folks in that part of the hill that were really bummed when Sonic Boom moved. Good luck finding a new place, and here’s hoping it’s somewhere on the Hill! I love roaming around in EM. I always seem to find something in the scratch bin and they have a great selection in general. I hope they find a better spot on the Hill. I was so excited when I moved here that there were two local record stores within quick walking distance. I visited EM first, they only had 1 of the 5 new albums I wanted in stock even though all 5 were mentioned on their web site. I special ordered the rest, took a few days for them to come in, and the prices weren’t at all competitive with Amazon but I didn’t mind, because I was supporting a small local operation. I’ve had much better luck finding things at Sonic Boom, but they’ll be gone soon too. I hope EM finds another spot on the hill, or it’s back to amazon for me. Yes to a music store returning to 15th. There’s a “For Rent” in the Tilden space again. Nowhere near as big as the failed EM and Sonic Boom spaces, but probably at least as big as the old 15th Ave Sonic Boom. Take a working class neighborhood with auto shops, warehouses and cheap rent. First comes the artists and kids. Then the cool little independent retailers. Followed by bars and clubs. Then restaurants. Then the yuppie restaurants (foodies are the new yuppies), then the high end retailers and high end condos. Building owners get greedy. The rents go too high, the independent retailers and lower end bars and restaurants move away (goodbye Atlas Clothes and La Puerta). Then the artists kids go elsewhere. The hood isn’t so cool anymore. The hipsters get relegated to a block or two. Rents plummet. Retail spaces sit empty. Low rents bring low rent drug dealers. Crime ensues. Blight begins. Welcome to Belltown in 5 years if the building owners don’t stop being greedy and losing a sense of what makes this neighborhood work. The highest paying renters are usually the ones with the least interesting store or restaurant. Pike/ Pine is quickly becoming Pioneer Square/ Belltown. If the Winston sells and is upgraded, good riddance. If Pike-Pine wants to survive someone better start talking about how to create a real mix of inexpensive housing for students, artists, musicians and young people. It needs to include rehearsal spaces, cheap rent for creators, etc. Small spaces for independent retailers need to stay available and the area should be zoned this way. And building owners must recognize that a store like Everyday Music is more important to the long term viability of the neighborhood than a high end clothing store. Of course, gluten sensitivity is a true medical condition, but for every person who actually has it there are many who are just claiming to have it, jumping on the bandwagon. Sigh. Another step in our march back toward feudalism. Is there a single politician in the USA who swill say what needs to be said and then take action?! When we get gouged on real estate, everyone suffers except the gougers, who are often greedy, deep-pocketed landlords. Gee, now we can overpay for clothing so a property-owner can skim big, easy profit off each shirt and skirt sold there. When Mitt Romneytalks housing price calamity, I see the mere beginning of a real estate correction and a slap in the face to our greed. We should be lucky to see real estate values fall, not rise. Almost no one really gets it, eh? This “free market” crap is for the rich and greedy, of which Everyday Music is neither. Sure, everyone knocked the big trendy developments before they happened on the Hill…before Pike/Pine became a foodie destination and offered superior nightlife options. But the fact of the matter is, if you can’t pay the rent, you must get out. With much easier and convenient ways of getting music, Everyday Music’s business model, as sad as it is for everyone who loves it, isn’t up with the times. Maybe Totokaelo will bring a great space where fashion and art enthusiasts can express themselves–and in time music businesses like Everyday will learn from their mistakes and do it right the second (-er…. third) time around. That being said, if you’re going to complain about the prices of high end clothes and home goods before you even see them and know the price tag (I doubt any of you have even bothered to check out Totokaelo’s beautifully curated e-commerce site)…perhaps you should also get on board to complain about why dinner at Spinasse or Oddfellows, or drinks at Tavern Law–all much beloved Capitol Hill spaces–are so expensive. Go ahead, blame it on the universe–food, books, records, clothing–everything has a price markup across the board. It might be unfair, but then again, who said life was fair? So, denial STILL isn’t a river in Egypt. Ashley, maybe an economics lesson is in order here. Spinasse (etc.) is great. It’s a high-end restaurant. those exist everywhere, except some poor areas and large swaths of suburban strips. Not complaining about that. Not complaining about any particular clothing store’s designs orofferings either. So, the question becomes, why can’t businesses that have been around for a long, long time such as EM afford their rents? Gee, Ashley, it might be the $30+ rents popping up all over the Hill. Not for Class A office space, but for off-the-beaten-path retail box spaces. Do you have any idea what that means? Clothing markup is often huge, especially where the clothes are made by exploited labor in Asia and Latin America. Music sales margins are very small. Wake up, Ashley. This is the reason for redistribution of wealth. This is the reason for $1200+ single-bedroom rents around Seattle. This is one major reason most families in the Puget Sound area opt-out of raising families in Seattle. It’s nothing against the shop you appear to have a vested interest in and everything to do with greed and lazy wealthy folks wanting more and more money for less and less effort -which causes the rest of us to work harder for less, if we can get work at all. quite frankly im sick of everything going digital. 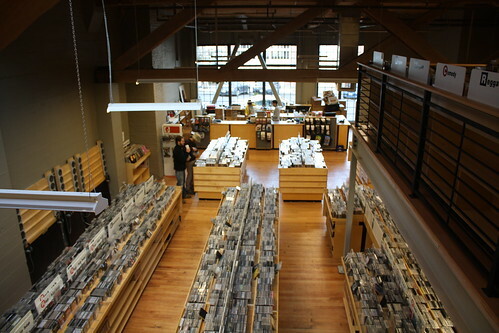 i love shopping at music stores rather than downloading. i like walking in neighborhoods & shopping in local stores. i like knowing that the $ i spend in these local stores will keep people employed rather than giving $ to websites whose ceos could care less about the neighborhood i live in. but, i guess thats progress? ? ? ? I’m curious about other locally-owned retail on the Hill. I know NuBe, next door, has a very specific and high-price point concept – how is she doing in the corner space? Copper Vine on Pine/14 Closed. Salon Dewi and that underwear shop shut down. Watch repair/clock shop closed. Whimsy? Gone. Retrofit moved – are they doing better? Izilla took Retrofit’s space, but didn’t I read on here that they had to start looking for a compatible co-tenant to pay their rent in the new space? Ba-bam closed their retail shop and went online. What the Hill needs is to figure out is how to create a walkable core(s) and get property owners on board with helping to better match up businesses that compliment their closest neighbors. This obviously is in their interest as well because the cost/losses associated with tenant default and turnover are high. The zoning on Old Ballard Ave probably helps a lot as well – there are no 6 story condo buildings in that 10+ block strip. Of course only national chains like Panera or Blick can afford space in a $40+/sq ft market. As long as our zoning lets this happen in Capitol Hill corridors like Pike/Pine, this is what we end up with in the end. Chains and expensive restaurants with $8 small plates and $10 cocktails. As a local capitol hill business owner who is struggling to stay afloat, I feel the pain of Everyday Music – you make a go of it and hope people respond to your concept and your location and your inventory. Sometimes you are well-capitalized by a wealthy significant other and can hang on longer than others, sometimes you throw all of your savings into a business idea you believe in and at some point you have to walk away and cut your losses. Locally owned, independent retail is almost always going to be more expensive than buying online or from large chains – you either embrace that because of the immediate gratification in taking something home instead of waiting on UPS, or for other reasons like wanting to spend more to foster the local business community. Leases on Capitol Hill are more expensive than ever, and in most cases small retailers are competing for space with restaurant owners with deep pockets or big backers – so they get stuck with spaces more obscure and off the beaten path. Those spaces have fewer (if any) comparable neighbors that can help everyone succeed from like-minded shoppers, and they eventually close. Its sad all around. I’d love to see the Capitol Hill Chamber of Commerce team get interviewed by CHS for their take on how retail is struggling on Capitol Hill. What are they doing to help? How are they advocating for affordable space for local businesses? Are they proposing changes to zoning to keep existing affordable space in tact? There’s no magic pill here, but it does encourage me to see this thread and realize how interested most of the people commenting are in finding ways to support another locally owned business. Good luck to both – EM and the new tenant.